(Press Unit in the Office of the Prime Minister) – Prime Minister Dr. the Honourable Timothy Harris used Sunday’s (May 20) Open Forum at the Edgar T. Morris Primary School in Tabernacle to again expressed his gratitude to his Cabinet colleagues for their unwavering support and commitment to the people of St. Kitts and Nevis. The prime minister also rubbished claims being made by Team Unity detractors that members within the Cabinet have called for his resignation. Dr. Harris stated emphatically that no member of the Federal Cabinet has asked him to step down as prime minister. The honourable prime minister further noted that he has been fortunate to have in the Cabinet Senior Minister, the Honourable Vance Amory, whom he described as an excellent statesman who brings with him a wealth of experience and knowledge from which he draws inspiration. 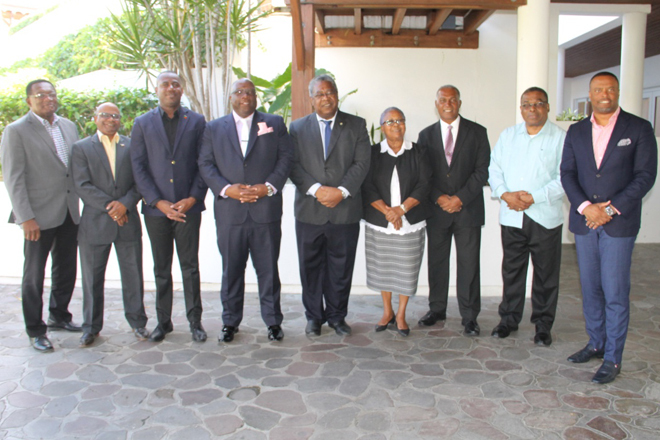 The Honourable Vance Amory was one member of the Team Unity Cabinet present at the Prime Minister’s Open Forum. Also present was the Honourable Ian Patches Liburd, Attorney General, the Honourable Vincent Byron, Senator the Honourable Wendy Phipps and Cabinet Secretary, Mrs. Josephine Huggins.